Most people in this world have a cable or satellite monthly subscription. And if you're one of them, just like me, then you will be getting fed up to the back teeth with constantly rising TV bills. Just as death and tax are inevitable, you also can be sure that those dreaded subscriptions will constantly rise. To make it worse, providers also keep getting into contract disputes with channels as well, remember the Time Warner Cable blackout of CBS channels? And until now there was never any real alternative, cable companies could happily ignore complaints and keep upping those bills as more subscribers were signing up daily to compensate for any that were leaving. Cable subscriber numbers were growing and there was nothing we could do. But now an internet based revolution is taking place, as you no longer need one of these cable or satellite subscriptions to watch movies. By using cheaper and even free internet TV services, shows, films and live sporting events can be found within a minute or 2. Most people can find any content they want online, and you can be watching that episode, season or film a minute later. In fact your choice of content is expanding by a massive amount. No longer does the customer have to face ever increasing subscription costs, for a package of hundreds of TV channels that never get watched, and a lack of any real competition as each provider charges a similar amount and offers the same programming. But now you can join consumers across the USA, the UK, Europe, Canada, Australia and across the world as they cut the cord and become their very own cable provider, using a growing number of online services and streaming providers. This phenomena is the biggest upheaval and change in media consumption ever. Many have likened it to the fall of the newspaper and music industries over the last decade. Although cord cutting is a liberating experience, it's also a daunting one for many who were brought up to consider cable as a god, satellite as a nurturing mother. The cable companies are now running scared, Providers that include Comcast and Time Warner Cable have been losing subscribers in ever increasing numbers. Satellite TV providers such as DirecTV and Dish Network have seen some growth, but streaming services such as those provided by Netflix, Hulu Plus and Amazon have exploded. Smart TV sets are becoming mainstream and more of the public are using catch-up services on a regular basis. To compensate, pay TV providers are offering more flexibility and online streaming services as well. But is it all too little too late? You may already have dipped your toe in the water and brought a movie from iTunes or Google Play, perhaps you have a Netflix or Amazon Prime subscription. 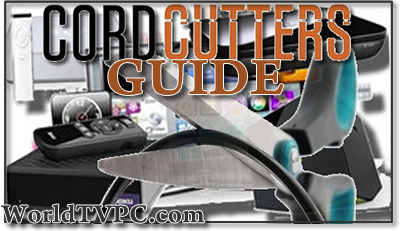 Whatever your experience or lack of as regards cord cutting, WorldTVPC is here to make life easier, clear those muddy waters and show you that there is another way to watch TV and movies without a paid cable or satellite subscription. You can partially leave cable i.e continue to pay the lowest cable/satellite subscription plan and use streaming to top it up, or you can fully ditch cable and get your entire entertainment from the web. Remember if you decide to cut the cord you also have the choice of how much you spend. Just remember to make sure you have a good broadband connection for all those streaming goodies. Although instant streaming from the web is great for watching movies and television shows, you will not find everything you want and live events, sports and even news are not so readily available. You can get round these problems though, and the end result is well worth the savings it will bring. Join us as we cut the cord together and explore all the options, both free and paid. We look at the hardware available, the streaming subscriptions and services. From Catch-up TV to a Roku box, add a dash of pay-as-you-view and online rental. mix in some TV apps and you will begin to see the light. We have put our comprehensive guide together to minimise the hassle and maximizing the ease and value you will soon be seeing. Now is the time to join the revolution. Streaming device (PC, laptop, Roku, Android etc.) Prices vary but you probably already own one. An account with pay-as-you-watch providers Amazon Instant Video, Google Playstore, iTunes (if you own an Apple device). Reccomended Subscriptions to Netflix Streaming service and Hulu Plus (both $8 monthly) - If using a PC use the free Hulu service instead. For most people free digital TV, which offers plenty of popular shows and live Sports which cable charge you for!.Along with Hulu, Netflix, Youtube and Crackle, will give you all you need. For the latest movies and cable shows, just pay to view from Amazon Instant Video, Google Play or iTunes for a couple of bucks per episode or ten bucks per season. First thing any self respecting cable cutter needs to do is get free digital TV. You can cancel the cable today by hooking up an antenna to your TV. An antenna costs from around $40 and will plug into any TV. Most TV sets now have digital receivers, so long as yours is 5 years old or less then it should have a digital tuner built-in to receive hundreds of OTA (over-the-air) free channels. Signals are sharp, crisp and many in HD format. An extra bonus is that many channels also offer a number of subsidiary channels as well. What Streaming Hardware To Choose? To access internet TV requires some form of connected hardware. For quick internet TV on your television set you probably already own a PC, tablet, console, smartphone, connected Blu-Ray or smart TV which are all equipped to a certain degree to stream movies and shows. If you want a quick and easy way to get connected to the big screen TV then you may want to invest in a dedicated streaming device such as a Roku, Apple TV, Boxee Box or Chromecast amongst others. These devices are designed just for streaming and generally have tons of apps and channels available (although Apple are still lacking in that department). Read our reviews of the best streaming hardware here. Of course you can stick with what you already have and happily be watching unlimited entertainment on that device. Here is where the choice can be a bit daunting. You have many options and could, for example go down the free route and use streaming websites, apps and catch-up TV services that cost zilch. To help you out we have listed the best free TV and streaming websites around, you will find hundreds of movies and shows on just these sites alone. Or you could sign up to a subscription service like Netflix for $8 per month, and maybe top this up by buying/renting media from iTunes, Amazon Instant or Google Play. The choice and cost is totally tailored by you. A subscription service will give unlimited streaming to a lot of great movies and shows, but it will not deliver the latest series and blockbuster movies. For that you will need a pay-as-you-watch style service such as iTunes, Amazon Instant or Google Play. The problem with these services is that you can burn a hole in your wallet pretty quickly if you are renting or buying on a daily basis. Sports can be more difficult to easily watch and is still the biggest reason that fans cling onto cable. In fact studies have shown that close to half all subscribers would ditch cable if they had the same access to sports TV. But there are ways that sports can be watched by using subscription services such as MLB.TV, NBA League Pass, and NFL Game Pass but just like buying movies and shows online, these can work out a tad expensive. The biggest sports network ESPN offer sports streaming but you have to be a subscriber to pay TV first. They are considering an internet TV only service but will expect users to pay as much as cable do, so add at least $5 per month just for the one channel. Check out the best sports streaming websites here, and here are some options for watching live sports online. For many potential cord cutters having plenty of kids TV available could be a deal breaker. And you're in luck as many streaming providers understand the way to many customers hearts is through their children. There are plenty of news streams on the web, to catch up on world, national and local news, you can stream from a number of 24-hour news networks such as CNN Live, Fox News, or ABC News for your daily news fix. If it all seems a bit too much, or your family is not suited to cord cutting and you decide that you want to keep your cable or satellite subscription, then you can still save cash. I guarantee you can get a better deal simply by contacting your provider and telling them you are ready to cancel. They will usually offer a better deal, a different package, or maybe a month or 2 for free as a sweetener to keep you as a customer. Cable Cutting. Is it for you?